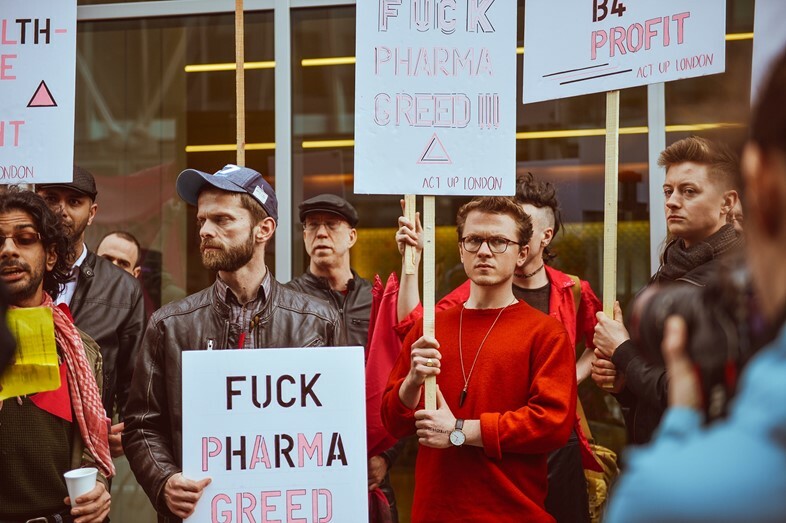 A group of protestors are standing in the glass-fronted central London lobby of pharmaceutical giant Gilead. A bemused, neatly suited male receptionist sits smartly behind his desk, unsure of what to do. The protestors are all stark, bolllock naked, you see. Thick black paint marks out the letters G-R-E-E-D on their backs as they stand there holding hands. Outside, on High Holborn, passers-by and bystanders peer into the reception area, while their fellow protestors unfurl banners and stop traffic. The receptionist clocks me looking through the window, and I wave at him through the glass at him. This must be the most interesting thing to have happened to him for months, I think. He smiles and waves back. I’m here with global advocacy movement Act Up’s London chapter. Today’s protest has been coordinated across multiple continents, taking in the New York offices of Pfizer, the DC headquarters of the pharmaceutical industry’s trade association, the South African headquarters of Roche and the Paris offices of Gilead France. London’s protest has been organised with the ruthless efficiency of a J-Lo wardrobe change or an engagement proposal flash mob. I’d received strict instructions to meet at the offices of the trade union Unite with my photographer. Inside, we meet with around forty protestors, chatting eagerly while drinking terrible instant coffee and pinning pink felt triangles to their lapels. One of the group’s organisers, long-time activist Dan Glass pulls me in for a hug before introducing me to the various protestors. “I’m involved with Act Up because I came to Europe under difficult circumstances, and it’s affected my ability to access care on the NHS. I’m Pakistani-Canadian, but I came here because I had to leave Yemen as a civil war was starting. People like me are seen as a burden on the system, and people seem to hate us for a variety of reasons.” 25-year-old Bilal Ahmed is explaining his involvement in today’s protest. “The system we have right now is basically that the large pharmaceutical companies, like Gilead, sell drugs to the NHS and then the NHS provides it based on what it can afford. But there are so many drugs, like Sovaldi (a hepatitis-C medication) or Truvada (which prevents you contracting HIV) which aren’t currently available on the NHS”. All of the activists I speak to are incensed by the unaffordability of life-changing drugs such as Truvada and Sovaldi (both of which are manufactured by Gilead). Despite widespread studies attesting to the effectiveness of Truvada in targeted interventions amongst at-risk HIV groups, and even given the fact that HIV infection rates are increasing in parts of the UK, the government recently chose not the make the prophylactic drug available on the NHS. Meanwhile, Sovaldi isn’t available to Brits living with hepatitis C due to what the NHS describes as its “prohibitive” cost – £35,000 for a twelve-week course of treatment. Claire Groves, 48, is one of those very Britons currently living with hep-C. For her, the protest outside Gilead’s offices has a personal dimension. “I was diagnosed with hep-C in 2008. I had the older, more toxic treatment in 2010, but I didn’t respond well to it and was left with a lot of long-term health problems, including mental health and depression”. Groves is one of the lucky ones, as it turns out. “I just got a call from the hospital yesterday and I’m going in on Monday to start a twelve-week course of Sovaldi. But it makes me angry knowing I’m costing the NHS this much money, when it doesn’t have to be this expensive. In Egypt a comparable treatment would cost $900. The pharma companies just view you as a number. They’re not interested in people as people, you know”. For all their amenable patter, the Act Up activists are ambitious in their focus. “I would love it if we could affect the Gilead share price, because their executives only understand things in terms of money”, 28-year-old Tommy Clayton tells me. 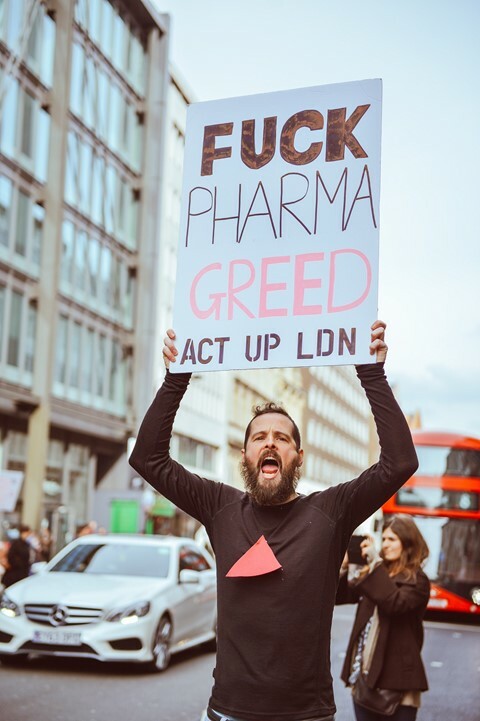 “I’m here to call out Gilead on their unfair pricing of medicines across the world because I take offence with a system that I see not only as being very unfair, but insensible. The ways that drugs are researched, developed, produced and distributed makes absolutely no sense to me.” When I ask him about how he came to be involved with Act Up he visibly softens. “They’re extremely good people, and we live in a very narcissistic, self-indulgent era, so it’s so rewarding to meet people who are doing things for others rather than just for themselves”. By now it’s time to fall in with the rest of the group as we make our way to Gilead’s offices, just around the corner. Ahead of me a man in full biker gear – with matching leather beret – chats to a willowy man in his twenties with a rose in his hair, elaborate lace-up boots and a flush of pink lipstick. I’ve reported many protests before, but none have been as good-natured as this. An advance party heads off: by the time we arrive they’ve already disrobed and are standing immobile in the reception area. Outside, pink banners are unfurled bearing the words “Pharma Greed Kills”. The remaining (clothed) protestors march into the road, blocking the traffic, immediately recognisable by their pink triangles (a nod to the symbols homosexuals had to wear in Nazi concentration camps). Bemused commuters swerve to avoid shouting protestors (“Thirty-five K is not ok!") and suited office workers sloping off work early peer into the Gilead lobby. I see the guy with the flower in his hair striding up the middle of the (busy) road with the swag of a top model perfecting their walk. Ahmed convenes in the centre of the group to read out the group’s mission statement. And then the protest is over, and the assembled activists let out an ululatory shout. In the reception, the protestors dress and embrace. The reception guy looks relieved. I don’t blame him. Gilead didn’t respond to repeated requests for comment prior to the publication of this piece.